How to start with PIC microcontrollers? Which development environment do I use? These reasons have led me to change to another controller solution. Finally, I decided to change to the Microchip PIC controllers. On the other hand, I personally would implement a more sophisticated architecture based on one instruction per oscillator cycle, i.e. 1 MIPS @ 1 MHz. This is more power-efficient and would at least indicate that there is best use made of every clock cycle when using a single execution pipeline. For the core, I would check the requirements carefully and decide whether to use a two, three or four stage pipeline. And for not loosing any performance, additional delayed-branching would be introduced. A deeper stack for the program counter may also be suitable, especially when serving a lot of interrupt sources and doing prioritized interrupt handling in software (i.e. another high-priority ISR call during a low-priority ISR call). Finally, an ability to check the stack levels used would also be welcome, as well as hardware-based context save on entrance and exit of the interrupt service routine. I started with the PIC16C84 (an early EEPROM version of today's standard flash version 16F84). provides many additional hardware resources, e.g. This setup programs most PIC microcontrollers (PIC12xxx, PIC16xxx, PIC17xxx, PIC18xxx), and allows firmware updates whenever new PIC controllers come out. I have never experienced any issues using this commercially available programmer with the Windows operating system (Win95, Win98, WinXP). You just have to ensure that the intended RS232 port to use is in the range of Com1 to Com4. The latest version of the PICSTART Plus programmer allows instant software-based firmware updates to the internal flash controller. 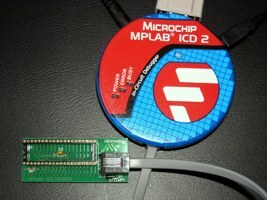 See microchipdirect.com for ordering details. Years ago, I had to buy an extra PIC controller (UV-erasable PIC17C44JW) and had to burn the corresponding firmware to it (HEX-file supplied with MPLAB IDE). But Microchip abandoned this re-programming procedure of the 17C44JW some times ago. Today, the firmware upgrade of the programmer is performed directly from MPLAB IDE, but only if you have one of the lastest flash-based PICSTART Plus programmer, or installed the PICSTART Plus Processor Upgrade Kit (containing a PIC18F6720) in your elderly programmer (#UK003010, costs about 29.00 US-$, ordering information). PIC16F87X devices are shipped with low-voltage programming enabled. 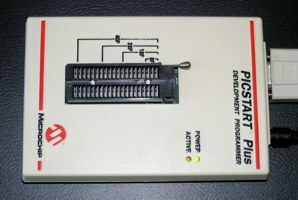 PICSTART Plus programmer uses the high-voltage programming method. Some devices do not exit programming mode properly if low-voltage programming is enabled, resulting in invalid read and programming operations. Place a 10 Kohm resistor between the RB3 pin and one of the ground pins on the programming socket. Refer to the device datasheet for the pinout of the specific device." As first step, read the documentation of your controller, especially the memory and register architecture, the instruction set (PIC Instruction Set Quick Reference) and the I/O port section. Then try to implement a blinking LED application using the PIC16F84 and a busy loop for waiting (you can also use my assembler module m_wait.asm). If your LEDs are blinking, you certainly want to connect your controller to your PC to exchange some data. Build a RS232 hardware setup with a MAX232 level shifter and a PIC. If you use the PIC16F84, the RS232 communication must be done by software. You can use the 'Simple RS232 interface'. Try first to burn the provided HEX-file onto the PIC16F84 to check for proper hardware setup. Once everything is working well, you can get the assembler source code and change the content according to your needs. Question: What kind of instructions are BANK1 and BNEQ? Answer: These are my standard macro definitions declared in the module file m_bank.asm. If you include this module file in your main program, you can make use of these instruction macros. For instance, the macro BANK1 performs a memory bank change to bank 1. Further, the macro BNEQ 0x23,LAB1 translates to 'branch on not equal w and 0x23' and performs a jump to label LAB1, if the working register w does not match the value 0x23. Question: What kind of instructions are BNZ and SKPNZ, since they are not listed in the Instruction Set Chapter of my PIC controller? Answer: These are 'Special Instruction Mnemonics' listed in Table B.11 in the PIC Instruction Set Quick Reference, i.e. built-in mini-macros of the MPLAB assembler. For instance, SKPNDC translates as 'Skip on no digit carry' and simply assembles BTFSC 3,1. Only declare the main assembler file as source file in the MPLAB project. For instance, this is the file PIC_Test.asm in the project PIC_Test.mcp below on the picture. It will generate a HEX-file named PIC_Test.hex when you execute 'build' or 'build all'. Ensure that the pathes to the include files exist - or remove the pathes and copy the include files to the directory of the main source. The include files must not be listed for separate compilation under the MPLAB Project. They are just included in the main source through include statements. During assembly time (MPASM), these files are just inline expanded and treated as normal assembler code. Separate compilation is neither needed nor possible, since the code of these modules has been written for inline compilation and (initially for simplicity) does not contain any object or linker directives. showing the project source file (PIC_Test.asm) to be assembled by MPASM. Once the communication between the PIC controller and the PC is running successfully, I suggest to implement a visual interface on your peripheral device (the PIC controller). This can be done easiest by using a commonly available dot matrix LCD and one of my LCD assembler modules. If more sophisticated I/O functionality is desired, you can consider to attach a standard AT keyboard (ordinary PS/2 PC keyboard) to the microcontroller. Look therefore at the AT keyboard projects. When your code grows, you will run into the architectural issues of the PIC microcontroller. The PIC instruction set has been defined - in early days - as a natural engineering trade-off between functionality and program memory requirements. One advantage of a larger instruction word width is the increase in direct addressable space for immediate instructions, e.g. 'CALL Label' with Label resolved to a program memory location by the linker/assembler. On the contrary, larger instruction word width require more program memory, what results in larger chip area and therefore higher manufacturing costs. The PIC16xxx microcontroller series features immediate address instructions (e.g. 'CALL' or 'GOTO'), which support 11 bit immediate values. Using 11 bits for immediate addressing, we can only address 2k words in the program memory. But what if we want to support larger memory space? One possibility to work around this limitation is to introduce a new instruction in order to jump between the different 2k memory blocks. That's why we need to deal with the upper two bits ([4:3]) of the PCLATH register. These bits cannot be altered with 'CALL' or 'GOTO' instructions, but need to be set manually before the jump. There is quite a good discussion and elaboration of methods to deal with paging for the PIC16xxx microcontrollers on this site. There exists a convenient built-in instruction-accurate simulator within MPLAB IDE, called MPSIM. You can enable the MPSIM simulator through the Debugger menu: Debugger -> Select Tool -> MPLAB SIM. RS232 character acquisition: Using a self-created stimulus file RS232_Stimulus_9600.sbs, it simulates the reception of character 'u' (equal to b'01110101') with one start bit, 8 data bits (LSB first), no parity bit, and one stop bit. R/C servo signal acquisition (pulse width measurement): For a self-made and programmable R/C servo reverse circuit using a PIC12F615, the incoming servo signal (i.e., R/C receiver output signal) is simulated within MPSIM using a specific stimulus file ServoPulses_01.sbs, which performs in total five pulses: The first two input pulses (width: 0.75 ms, 2.25 ms) are outside specifications and check the correct error handling of the program, the next three pulses exercise normal operating conditions (width: 0.95 ms, 2.05 ms, 1.5 ms). Manual stimulus creation for R/C servo signal acquisition applying a total of five pulses: 0.75 ms, 2.25 ms, 0.95 ms, 2.05 ms, 1.5 ms. The sequence is repeated after another 9.5 ms, restarting at 1 ms. Messages of the MPSIM simulator concerning the applied external stimuli. The applied stimuli and generated output signals can be graphically verified by using the built-in logic analyzer in conjunction with MPSIM. It can be quickly ensured, that the desired stimuli are applied at pin GP5, and the output PWM signal is generated at pin GP2 - by ignoring the two out-of-spec input pulses at the very beginning. Check the correct project settings for simulation: 4 MHz device clock, enable 'trace all' for logic analyzer support within simulation, adjust the trace buffer (128 k lines). Below a screenshot of a code assessment using the MPSIM simulator, external stimuli, and the stopwatch provided by the MPLAB IDE. It shows the the correct value of 2.05 ms for the R/C servo signal output - after 'reversing' an acquired input signal of 950 us. So MPSIM has been used for quick functional verification of code having been developed from scratch - without any real hardware involved. In fact, I didn't have the hardware at hand during code development. The stopwatch is a very convenient tool to assess the performance of specific code sections. It can also be used for verification of selected functionality, e.g., as depicted, the correct R/C servo signal reversing based on an acquired 950 us input pulse, which is finally generating a 2050 us output pulse. The stopwatch of MPLAB IDE can also be used to assess code developed in high-level languages. There exist several commercial solutions to program the PIC microcontroller in C. In the past, little of them were available for free - but this has fortunately changed recently. Please see the list of free C compilers below. A very interesting C compiler comparison is provided by CCS, Inc. Please note, that this information is not independently verified, but are rather volunteer contributions. If you know other free C compilers, you are kindly requested to email me. I will add it to the list below. Personally, I use the CCS C compiler for developing PIC microcontroller code in a high-level language. I can recommend this compiler, although I regard it as a professional tool with respect to quality and pricing. The CCS C compiler can be ordered with its own integrated development environment (IDE), but also has a plugin for seamless integration into the Microchip MPLAB IDE. In general, it is quite useful to cross-check the assembler code generated from C sources to get an impression what preconditions have been assumed by certain C functions. For instance, get_timerX() assumes a running timer and therefore generates more code than necessary in case a timer being halted is considered. Moreover, the granularity concerning the control of underlying hardware blocks is usually coarse-grained. For instance, the timer can not be halted and restarted with given C functions (only disabled and reconfigured/enabled), instead, we need to resort to our own specific declarations in order to gain access to such functionality, as shown for timer 1 in the box below. The CCS command-line C compiler for 14-bit opcode PIC devices, e.g., PIC12F615, PIC12F683, PIC16F84, PIC16F877, PIC16F887, is prepared for seamless integration into MPLAB IDE and starts at 150 US-$. By using the #BIT and #BYTE statements instead of plain inline assembler code, I seek to properly address the bank/page characteristics of these special function registers (SFRs) - inherent to the PIC architecture and mandatory to be known by any high-level language compiler - by delegating the correct handling to the C compiler. Employing call by reference for function my_get_timer1() prevents the introduction of any additional temporary variables (scratch RAM for the call stack, would be even partly present in conjunction with function inlining), but directly copies the contents from TMR1L and TMR1H to the 16-bit variable tmr_val. Write only small pieces of new code, whenever possible within a simplified test program. Most hobby-developers have no expensive in-circuit debugger tool (real-time debugging in the target application using specific software, with breakpoints and register watches). Use therefore dot matrix LCD and/or RS232 interface for debugging. Use encapsulated well-verified blocks, which you put together as parameterizable building blocks in the target application. For large projects, try to use object code and the linker provided by Microchip MPASM IDE. During the code development, overly generous compilation messages are sometimes nasty and contra-productive. Therefore, I turn off selected compilation messages during development by using the statements below. However, it makes sense to temporarily re-activate those messages. For instance, message 302 serves to check the correct bank access scheme for selected configuration registers. Recommendation: After development of the configuration section, temporarily turn on message 302 and check all compilation messages concerning correct bank access for configuration registers. To prevent unintended page crossings of tables, seek to add unique labels to the beginning and end of each table and provide a corresponding check, i.e., assertion. The assertion is executed during each compilation and ensures the integrity of the table alignment. ERROR "Welcome table hits page boundary!" You may also use one of the communication test programs, commtest1.asm or commtest2.asm, which transmit constantly status messages '@' and echo on every received character. Question: I can not figure out the connection between dot matrix LCD and PIC microcontroller. Do you have a schematic? Answer: Basically, there is a text description in the header section of each LCD assembler module file. But here is also a PDF schematic to illustrate the connection between display and controller. Answer: I've recently adapted some parts of the initialization section of the LCD module files (longer wait delay after display clear). I assume you have a newer type of display controller than the traditional Hitachi HD44780 (PDF data sheet, 389 kB). In case you have the LCD controller Samsung KS0073 (PDF data sheet, 673 kB), you have to set the constant 'LCDTYPE' to 0x1 in your main program. This adds specific configuration commands of the new controller type, i.e. the extended function set to set up the line count (PDF data sheet, 186 kB). You may have to adapt the line count to your KS0073-type display in the extended function set part of the LCD initialization section of the LCD module file (e.g. m_lcde.asm). If this does not help, try to use longer delays for the initialization procedure. In case of failure, ensure that you do not use the temporary registers at BASE+0 - BASE+3 elsewhere in your code, especially not in your interrupt service routine (ISR)! If this setup works perfectly, you may upgrade to the more efficient LCD modules m_lcde_bf.asm or m_lcdexbf.asm (busy flag instead of wait loop). If you cannot compile the projects and errors like below appear, you did not specify the path to your include files correctly. Executing: "C:\Tools\HW\Microchip\MPASM Suite\mpasmwin.exe" /q /p16F84 "LCDx_test.asm" /l"LCDx_test.lst" /e"LCDx_test.err"
Although most of my code is below the critical size of 2k instruction words, page crossings may occur if you extend the assembler source code to your needs. Please read the recommendations about paging above. Below are some interesting text snippets found on the web about the history of Microchip PIC controllers. A complete version of John Bayko's interesting 'Great Microprocessors of the Past and Present' may be retrieved at http://jbayko.sasktelwebsite.net/cpu.html. The roots of the PIC originated at Harvard university for a Defense Department project, but was beaten by a simpler (and more reliable at the time) single memory design from Princeton. 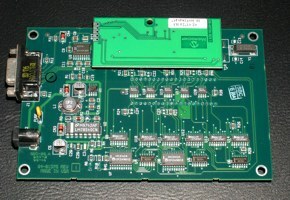 Harvard Architecture was first used in the Signetics 8x300, and was adapted by General Instruments for use as a peripheral interface controller (PIC) which was designed to compensate for poor I/O in its 16 bit CP1600 CPU. The microelectronics division was eventually spun off into Arizona Microchip Technology (around 1985), with the PIC as its main product. The PIC has a large register set (from 25 to 192 8-bit registers, compared to the Z-8's 144). There are up to 31 direct registers, plus an accumulator W, though R1 to R8 also have special functions - R2 is the PC (with implicit stack (2 to 16 level), and R5 to R8 control I/O ports. R0 is mapped to the register R4 (FSR) points to (similar to the ISAR in the F8, it's the only way to access R32 or above). The PIC16x is very simple and RISC-like (but less so than the RCA 1802 or the more recent 8-bit Atmel AVR microcontroller which is a canonical simple load-store design - 16-bit instructions, 2-stage pipeline, thirty-two 8-bit data registers (six usable as three 16-bit X, Y, and Z address registers), load/store architecture (plus data/subroutine stack)). It has only 33 fixed length 12-bit instructions, including several with a skip-on-condition flag to skip the next instruction (for loops and conditional branches), producing tight code important in embedded applications. It's marginally pipelined (2 stages - fetch and execute) - combined with single cycle execution (except for branches - 2 cycles), performance is very good for its processor catagory. The PIC17x has more addressing modes (direct, indirect, and relative - indirect mode instructions take 2 execution cycles), more instructions (58 16-bit), more registers (232 to 454), plus up to 64K-word program space (2K to 8K on chip). The high end versions also have single cycle 8-bit unsigned multiply instructions. The PIC16x is an interesting look at an 8 bit design made with slightly newer design techniques than other 8 bit CPUs in this list - around 1978 by General Instruments (the 1650, a successor to the more general 1600). It lost out to more popular CPUs and was later sold to Microchip Technology, which still sells it for small embedded applications. 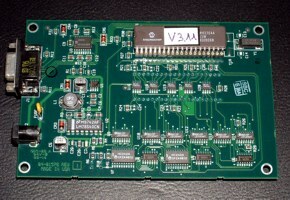 An example of this microprocessor is a small PC board called the BASIC Stamp, consisting of 2 ICs - an 18-pin PIC16C56 CPU (with a BASIC interpreter in 512 word ROM (yes, 512)) and 8-pin 256 byte serial EEPROM (also made by Microchip) on an I/O port where user programs (about 80 tokenized lines of BASIC) are stored. Actually, the PIC architecture was first integrated by Signetics for a company in San Jose (Scientific Memory Systems as I recall) using Bipolar technology and dubbed the 8X300. Prior to that, the architecture had been a scientific curiosity since its invention by Harvard University in a Defense Department funded competition that pitted Princeton against Harvard. Princeton won the competition because the mean time between failure (MTBF) of the simpler single memory architecture was much better, albeit slower, than the Harvard submission. With the development of the transistor and IC's, the Harvard Architecture is finally coming into its own. Microchip has made a number of enhancements to the original architecture, and updated the functional blocks of the original design with modern advancements that are in concert with existing architectural processes and enabled by the low cost of semiconductors. Back in 1965, General Instruments (GI) formed a Microelectronics Division, and indeed used this division to generate some of the earliest viable EPROM and EEPROM memory architectures. As you may be aware, the GI Microelectronics Division were also responsible for a wide variety of digital and analog functions, in the AY3-xxxx and AY5-xxxx families. GI also generated a 16 bit microprocessor, called the CP1600, in the early 70s. This was a reasonable microprocessor, but not particularly good at handling I/Os. For some very specific applications where good I/O handling was needed, GI designed a Peripheral Interface Controller (or PIC for short), in around 1975. It was designed to be very fast, since it was I/O handling for a 16 bit machine, but didn't need a huge amount of functionality, so its microcoded instruction set was small. Hopefully, you can see what's coming....yes, the architecture designed in '75 is substantially the PIC16C5x architecture today. Granted, the1975 version was manufactured in NMOS, and was only available in masked ROM versions, but still a good little uC. The market, however, didn't particularly think so, and the PIC remained designed in at a handful of large customers only. During the early 80s, GI took a long hard look at their business, and restructured, leaving them to concentrate on their core activities, which is essentially power semiconductors. Indeed they are still doing this very successfully now. GI Microelectronics Division became GI Microelectronics Inc. (a wholly owned subsidiary), which in 85% was finally sold to venture capital investors, including the fab in Chandler, Arizona. The venture capital people took a long hard look at the products in the business, and got rid of most of it - all the AY3- and AY5- parts and a whole bunch of other stuff, leaving the core business of the PIC and the serial and parallel EEPROMs. A decision was taken to restart the new company, named Arizona Microchip Technology, with embedded control as its differentiator from the rest of the pack. As part of this strategy, the PIC165x NMOS family was redesigned to use one of the other things that the fledgling company was good at, i.e. EPROM - the concept of the CMOS based, one-time-programmable (OTP) and eraseable EPROM program memory PIC16C5x family was born.